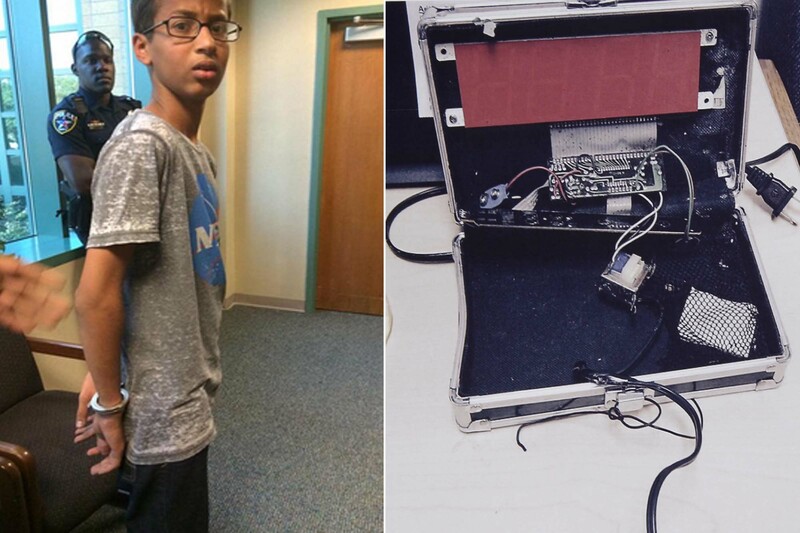 This is the clock that 14 year old Ahmed Mohamed brought to his school in Texas, USA. He built it himself and wanted to show it to his engineering teacher. His teacher was impressed but told him to keep it hidden in his backpack for the rest of the day. But while in English class, the clock was heard beeping after which his English teacher requested to see it. He was then sent to the Principle's Office and police were brought in for questioning. He was questioned for an hour and then taken to a juvenile detention center where he was fingerprinted and then finally released to his parents. It is against state law to have a hoax bomb or to make others think you have a bomb so the school took the precautions they thought were necessary in dealing with the situation. Ahmed and his family believe that he was detained mainly because he is Muslim while the school argue that they should be strict whenever they believe the safety of the school is jeopardized. Ahmed received mostly support including support from President Barack Obama, Hillary Clinton, Mark Zuckerberg, and even astronaut Chris Hadfield. But he has also received criticism, including from Bill Maher and Richard Dawkins, that argue that the safety precautions taken by the school were justified given the terrorist attacks around the world. Some critics even go as far accusing Ahmed and his family for staging the scenario in hopes of getting in the public media. What do you think? Does the clock look like a bomb? Was the school overreacting? Was it a hoax to seek attention? Comment and let your opinion be heard!